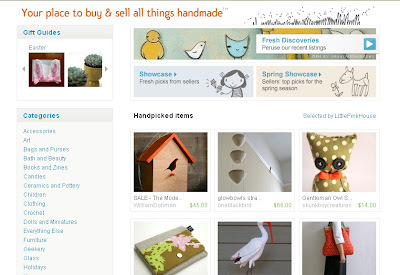 I typically don't post every time I make the front page of Etsy, but this morning I opened the homepage and found my owl Gentleman Swappie gracing the front page and had to share. He looks so handsome! I know numbers don't really mean that much (except for a little pride and a little prize! ), but I am about to hit 400 sales, and I'm super stoked-- I already know what my reward is! 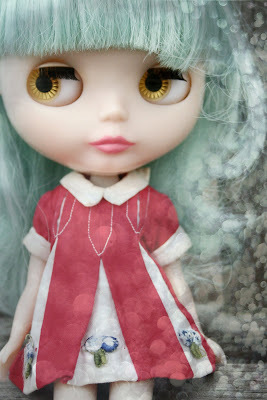 My newest Blythe (see pic below) has already left me for California (thank you SO MUCH Johnny! 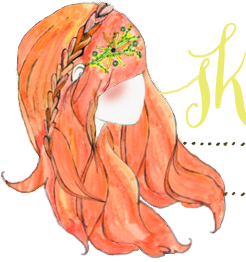 ), where she is staying with a woman who will customize her and make her more beautiful than ever! I can't wait to get her back! This week has been crazy. It seems like I'm saying this most weeks, these days. The nice weather has been amazing... oh, scratch that. Today it's supposed to snow. Have I mentioned how ridiculous this is? Anyway, the shop has been super busy AND I was doing a secret project that consumed me for days... I just couldn't get inspired by it. Unfortunately, I really can't even share until June or July or something. Sorry. I hate teasers. Anyway, I hope you all have a lovely weekend full of sunshine... mine will be dreary and cold, and a bit lonely. 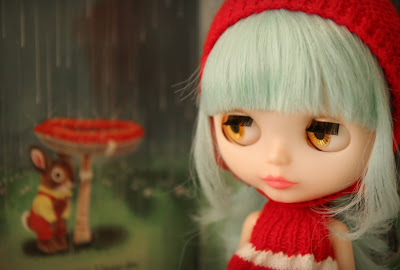 I'm waiting on my new Blythe to come in the mail, and my desperation is getting sadder and sadder (so melodramatic, right?). 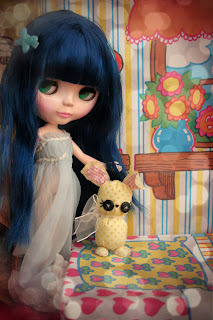 So, just so you aren't taking that seriously at all, I'm perfectly capable of keeping myself company, and I'm not at all dependent on a doll (though, lately when I'm out shooting pics of my Blythe people keep looking at me like I'm crazy). Do something lovely, I'll see you next week! I first saw this on the Roadside Projects blog this week and I can't stop thinking about it. I wish it would be out sooner! After we left you, we went to the park for a very windy photo shoot and lots of running around. It was bliss. I will be back soon for more vintage goodness. Until then, stock up. I don't know how this slipped my mind, but everyone who orders a bunny from the shop before Easter will get a fun little surprise along with it! I'm excited just to pick these out! Oh, also, some Skunkboy Love is going out today. I know who it is!!!! Antler is a new online fashion magazine, with a lot to offer. They don't focus solely on fashion; they dabble in a lot of different things to bring something new to the table. 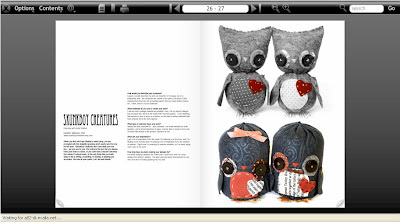 I'm proud to be part of the first issue, and I hope that the magazine just grows and grows! It's way too much fun. Today was a grumpy/wonderful day. How does that even happen? Whenever I have too much going on at once I tend to stress... this leads to grumpy Katie, which, if you hadn't already guessed, is NO fun. So, my day went from "I'm sitting in my jammies fixing and conditioning Blythe hair", to "I'm stressing out because I have people coming over tonight and there's laundry everywhere", to taking a trip to the next town over, and finding some darling treasures. Once I was coaxed out of my funk, it was a good time. I found this awesome lamp some time last year, but was completely unwilling to pay what the price tag wanted. When we went back today it was still there and the owner of the place was ready to see it go. This worked out well for me, being that I'm completely in love with it! We also found a vintage pinball machine... not a full size one, but also not a mini one. It dings and keeps score and everything... well, it's just a ton of fun and completely addictive. Hope loved the yellow bunny so much that she took her for show and tell this week. It completely warms my heart when she gets so excited about the animals that she wants to take them to school and show them off. I can't believe the weekend is here already! I hope you will get to go outside and really enjoy it! I'll have more Swappies to share on Monday! Curse you UO. I've had my shopping under control... that is, until the weather turned beautiful (like 75 degrees) and I happened upon your lovely spring dresses. I want. Okay, time to leave this computer and go outside. It is so beautiful! Also, I'm gearing up for some disco bowling tonight-- Eric, don't let me down! I'm enjoying the weather and taking care of a small girl with Bronchitis (which don't really go hand in hand), so I thought I'd just share a song and head back upstairs to coddle my little one. Happy (no jury duty this week) Thursday. 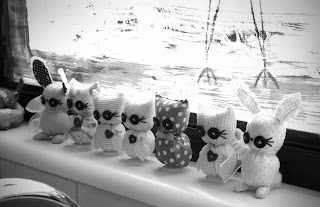 These little friends are a custom order that is getting ready to leave for Canada. This little sweetie is hopefully a bit of fun! She's my newest endeavor-- Skunkboy Swappies. They are hand-size animals ready for trading. How great would that be? Swap animals with friends? I want someone to trade with me! Anyway, any feedback on this would be great-- I can't decide if I'm acting too much like a little kid about this. That's all for now... 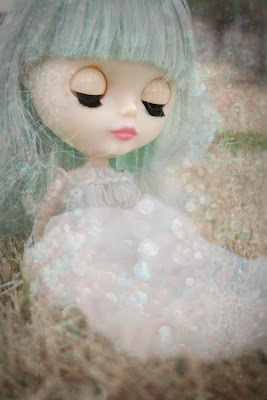 I'm off to go Blythe shooting with Hope!